Biogenic substances in nature contain significant amounts of less abundant stable isotopes (SI) of light elements such as hydrogen, carbon, nitrogen, and oxygen. 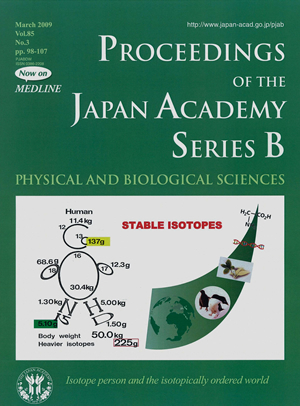 A person (left panel) illustrated with the SI symbols is really constituted of mostly lightest stable isotopes and some amount, heavier ones. For instance, a human body weighing 50.0 kg contains 137 grams of 13C, 5.10 grams of 15N and so on. Altogether he/she has 225 grams of heavier isotopes of biophile elements within his/her body. Dr. Eitaro Wada is a pioneer in the field of nitrogen isotope ecology, found its constant enrichment of 15N in the food web steps, and applied it to marine and terrestrial ecosystems. Later he added 13C, the most abundant heavier isotope together with 15N as highlighted in the Isotope person which is the most popular logo. Yes, we are what we eat. Although the SIs of a particular element have rather similar chemical behaviors, their specific thermodynamic properties and rate constants in chemical and biological reactions differ. The SIs of biogenic substances vary depending on the isotopic compositions of the reactants, the pathways and kinetic modes of the reaction dynamics, and the physical, chemical, and biological conditions. Thus, every biogenic material has its own unique isotopic composition, known as the “dynamic stable isotope fingerprint”, which is determined by its function and position in the material flow of an ecosystem. In fact, the relative SI abundances in biota are determined by dietary lifestyle, e.g., the modes of drinking, eating, and excreting. The natural environment is, so to speak, the site of large-scale tracer experiments in time and space. Fundamental data as to the history of a molecule or a material can be obtained by precise determination of the isotopic ratios of the organisms of interests. More accurately, each person has different isotope compositions depending his/her food habit. We, thus, can understand how to use the stable isotope method (SI-Finger Print) in food web analysis and the studies of this type should provide a new paradigm for understanding microscopic processes and macroscopic biological phenomena in natural systems. Dr. Wada described how the natural system had been disturbed by human activities especially in watershed of Lake Biwa and Yodo River. Through carbon and nitrogen isotope studies, he opened the way to understand comprehensively the world. And the world is isotopically ordered, throughout amino acids, DNA, plants, animals, herbivores, carnivores, ecosystems, and the Earth’s environmental system (right panel).